Some losses are just hard to take and harder to explain. The University of Hawai’i basketball team’s 87-84 overtime loss to Cal State Northridge in the quarterfinals of the Big West Conference Tournament is a prime example. Indeed, there was not much to say after a roller-coaster game ended with the Warriors going off the tracks at the end. Cal State Northridge hit a game-tying 3-pointer in the closing seconds of regulation, then scored four points through unconventional means in the final 19 seconds of overtime to steal the win from the Warriors at the Honda Center in Anaheim, Calif. It brought a heartbreaking – and frustrating – finish to an otherwise thrilling game for the Warriors. Hawai’i trailed by as many as 16 in the first half, led by as many as 13 in the second half, and seemingly had the momentum to win in the closing seconds of both regulation and overtime. The Warriors, who were the No. 4 seed for the eight-team tournament, dropped to 20-11. There is still a possibility that Hawai’i could receive an invitation to the CollegeInsider.com Postseason Tournament (CIT) or the College Basketball Invitational (CBI). Official announcements for postseason tournaments will take place on Sunday. Arnold did not sound confident that the Warriors will receive an invitation. The Warriors seemed to be in control of the overtime after taking an 84-81 lead on a free throw by Keith Shamburger with 24 seconds remaining. Then it went awry. The Warriors fouled Northridge guard Josh Greene – a 92 percent free-throw shooter – with 18.7 seconds left, and he responded with two free throws to cut the Hawai’i lead to 84-83. Greene was 4 for 7 from 3-point range in the second half/overtime. “We wanted to foul him before he could get another 3 off, but we wanted to foul him under 10 seconds,” Arnold said. “I think we fouled him a little too early on that … Quincy (Smith) made an aggressive move on the ball. I don’t think he was trying to foul, actually, at that time. Looks like they were trying to call a timeout and he kind of made an aggressive play (for the ball). That wasn’t the game. We had plenty of chances to win it before and even after that. After Greene’s two free throws, Hawai’i turned the ball over immediately – Shamburger appeared to be pushed out of bounds as he caught the inbounds pass, but no foul was called. Northridge’s Stephen Maxwell then made a difficult driving shot to give the Matadors an 85-84 lead with 12.2 seconds remaining. On Hawai’i’s next possession, Isaac Fotu was called for an offensive foul while trying to set a screen. Tre Hale-Edmerson hit two free throws to give the Matadors the final 87-84 advantage. Brandon Spearman’s final 3-point attempt bounced high off the rim as the horn sounded to end the game. Christian Standhardinger led the Warriors with 28 points and nine rebounds. He shot 7 of 11 from the field and 14 of 16 on free throws – establishing new UH season records for free throws made (195) and attempted (254). Shamburger added a season-high 20 points, along with five rebounds and five assists. He scored eight of the team’s 10 points in overtime. Brandon Spearman scored a season-high 17 points on 6-of-9 shooting. 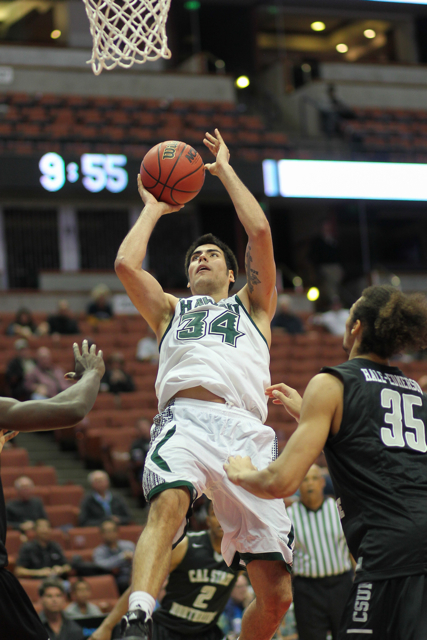 All-Big West forward Isaac Fotu was held to six points on 3-of-10 shooting, but grabbed seven rebounds. Shooting guard Garrett Nevels scored six points, and fouled out with 5:09 remaining in the second half. Northridge opened the game with a 10-2 lead, and had a 37-21 advantage with 4:48 remaining in the first half. The Warriors got back into it with a 10-0 run that cut the Northridge lead to 37-31 with 2:46 remaining. The Matadors eventually took a 42-36 lead at intermission. Northridge shot 60 percent from the field in the first half, while the Warriors shot 40.7 percent. Northridge had a 46-40 lead early in the second half, then the Warriors went on a stunning 21-2 surge over an eight-minute stretch to take a 61-48 lead with 10:35 remaining. The Matadors countered with a 15-4 run later in the second half to cut the Hawai’i lead to 72-71 with 1:53 remaining in the second half. A driving shot by Shamburger gave the Warriors a 74-71 lead with 22 seconds left, but Northridge came right back with a 3-pointer by Josh Greene to tie the score at 74 with 11.8 seconds remaining. 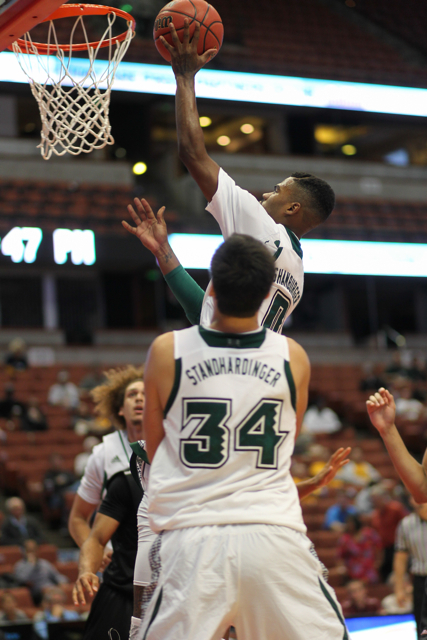 On Hawai’i’s final possession of regulation, Shamburger tried to drive in for a layup, but it was blocked. Far as I am concerned, now having viewed BWC post game interviews, reaction of Coach Gib , Spearman and Christian, Coach, and team are true Warriors, very, first rate , High Character individuals, They wanted so badly to win game for not only team, for all of Hawaii and their fans. Not the way they wanted season to end for sure! Kudos and props to Coach Gib, for bringing together such a diverse group of MBB student athletes who truly love Hawaii and team. It is a joy to watch this program grow. Gib will have a great season 5, and returning players plus additional recruits will make UH MBB team, have good 2014-15 season, cannot wait. All of life and sports lessons, if one can learn from, will make UH MBB program and young guys better. Much Aloha for Gib Arnold family , wife and 5 great kids for their support of dad and the guys. Mahalo to WI supporters, Schmidt Ohana, and the forum members new and old. We all like UH MBB hoops. Sure, Beeman and gals we love and wish the best for, however this site, is for UH MBB , and we appreciate Dayton Morinaga and his staff, and video editing supreme for making this forum possible! Go Bows! Look forward to next season. From the start of BWC , UH will be there at the top! And best wishes to all the families of the team, and shout out to Latvia, Germany, Canada, and New Zealand, Fotu family. Go The Mighty Warriors! In retrospect, I know how Ben Jay feels about cost consideration for C.I.T. or more expensive CBI tournament, however, in respect to Warriorlike, effort, and winning season by UH team , and in particular Seniors, it would be worth Ben’s going full bore, to communicate with CIT and CBI, and seeing if can drum up support from donors, and those powers that be that support UH MBB program. This team is worth vesting, so they can play another possible 4 games to reach a championship venue. This team can play on the road. The are Road Warriors. Just a joke, maybe, hopefully if the get CIT OR CBI invite , make sure the games are not on Thursday..! Love the team, the more I reflect on how UH made the huge comeback, and should have had this win, and be in semis against LBSU, it still does not have the proper finality to season. One more run towards a post season championship game, a run at 3 or 4 more wins, even on the road, would be worth it Ben Jay. Warrior, or Rainbow Warrior nation, the true die hard fans, want, Christian , Davis and Brandon Spearman, to have a shot at a 23-25 game winning season total. If possible Ben Jay, get on that phone ASAP, work out the logistics and get it done. General admission seating, for any home games, and half hour early open for concessions would be a start. Larry Ellison spotting? Support? Donor? This team so exciting, and 100% never say die effort, we want season to continue…well that is my Mantra for the day…If Ben Jay and CIT , CBI not feasible, well so be it., however, not too many 20 win NCAA DI BB teams sit at home, usually, unless under NCAA sanctions, are not in post season tourney of some kind, Just ask Santa Barbara, sure they will be in CIT OR CBI..
Just a thought Ben Jay. If cannot do, well, support the team and coach, and see you all next year! Uhfanzonly1. Sorry fans, such a roller coaster ride of game and season, however so exciting when team playing great, don’t want it to End just Yet! Lord knows how much I hate to lose, but to put things in perspective and absent of emotion as fans, we have just joined the ranks of the other 347 teams that will go out this way without a trophy. That is what makes March Madness so special. I so feel for the players, particularly the seniors, and the coaches who put their heart and souls into all that we, as fans, get to talk about and look forward to almost year around now. As Spearman said, “The future of this program is in great hands”. If you ask any coach what the secret of success is in any sport, they will tell you that it is 80% to 90% about Recruiting. We have an Excellent Recruiting Coach, one who has real roots here, one who is getting paid less than 20% of the average salary of the 68 coaches that have their programs in the NCAA Tournament. Hawaii is such a unique place, but because of its uniqueness, we have to be that much better and stronger as athletes to be able to fly 6 hours, West to East, and take on every opponent. I watched not only our recruitments last year, but I watched the other Big West teams. We did very good, but so did Irvine and others. As a coach, you recruit to beat the #1 and #2 teams in your conference. I have seen a steady improvement since our Coach has come onboard, not only in the wins and losses, but type of players that are good student athletes and involved in our Community. The fan base is growing every year and we do have the largest arena in the conference, by far. I look forward over then next month to finding out just who will be our next two recruits and have total confidence that we will all be talking about next year’s team and counting the days. Mahalo to seniors Christian, Brandon and Davis for everything they have done for our program. They played their hearts out yesterday and their careers will not be forgotten. We will sorely miss their intensity and passion next year. I have no doubt that success awaits them in their future. The loss hurt. The athletes gave it their all. Decisions could have been different. However, have to love the type of student athletes Gib has now. Backbeat, you are correct, though there is a faction that thinks differently, however the reality is, Hawaii is in the mid Pacific, thousands of miles away from the PAC 12, etc. for these dozen or so, recruited players, to buy into Gib’s One Ohana UH MBB, truly special. That is the question, who could have brought UH steadily from first year 19, 16, 17 and now 20 wins, and within a few minutes of semifinals of a really competitive BWC tournament, …well Gib Arnold did it. As Brian M. stated, this team has genuine REAL GOOD CHEMISTRY..they wanted to win, and ARE WINNERS..no one player walked off the court..they stayed together, played together , won and lost together, and will walk away from this season together, as Great Young men, and have good futures post UH. Now, Backbeat and BigIsland Hank, I too, along with scores of other UH MBB fans, have to focus on the next FUN PART of year: RECRUITING..possibly another 2 scholarships to give. Gib go after the best athletes to shore up scoring and rim protecting, however, Backbeat, you nailed it on the head…Still HAS TO BE RIGHT FIT, HIGH CHARACTER GUYS…like the ones that competed last night in Anaheim. That was one heck of a comeback by UH and CSUN, hurts to lose, however, cannot fault effort of coaching staff and team, they gave their all, I am sure, the AD saw that in person. Go Bows! Go Rainbow Warriors! If Isaac Fotu wants to go to THE LEAGUE, the NBA, he should stay another year to sharpen his overall skills. He would be hybrid SF/PF. Has to work on ball handling, passing the ball, creating his own shot, defense, Rebounding, a whole level above his great sophomore career. When Isaac went up against guys that were similar or more athletic, with doubles, or just able to reject his shot, Isaac goes 3 for 10 from the field. He would need at least one more year, to be Also A threat from Perimeter. He has the ability, has to work on having a much more overall game. The NBA is loaded with bench warmers that are highly skilled. If Isaac, his goal is overseas, well, if right opportunity, he will seek, or not. I still say, all NCAA college BB athletes want a shot at the highest level, and Isaac has to have another year to work on skill. See how he does next year against, the elite of NCAA DI, just dominates them, then see how his stock is as potential NBA pick. Just my opinion. Example is Christian. Not the most gifted MBB athlete, however, his drive, and passion, the effort, and he gets 28 pts, 9 boards. just constant max effort , using the best of his ability. Isaac Fotu can get there, He is a very special recruit at 6’8″, maybe next year, about 240-245 pounds of muscle, and speed. Hope Isaac makes right decision. Still think he comes back for Junior season. can we stop spreading rumors about Fotu leaving? for what? not the NBA. why would he leave to go play in NZ when he has a shot to make real money in the NBA? xer 21. actually was a SA writer that threw that possiblity out there. His thought.. After this season the NZ teams would come after Fotu, make offer. Like Steven Adams , 7 foot NZ part tongan athlete from Pitt, who is doing well in NBA, Fotu wants a shot at NBA. Isaac is getting better every year. IN my opinion , he still needs another year, to develop an NBA game. He could be like a DeJuan Blair, Paul Milsap, undersized hybrid PF’s, or with perimeter game, a hybrid powerful SF. Why does the SA writer throw that possibility out there? I think to draw attention to his column , blogs, or sell newspapers. Other UH fans, think Fotu can make the NBA after this season? I think he has at least One More Year to go and get to that level. He can have a great Junior Year. But they’ve made that offer to Fotu more than once already. we only just heard about it publicly this season. that offer was there out of high school. but he’s nothing like Paul Milsap. and Fotu needs at LEAST a year, if not two, to be NBA ready. and he threw out that possibility because it is a possibility, even if it’s not likely. I love Fotu but stop the talk about the NBA. He needs to show he can take the team on his back and make it win without Stanhardenger. That certainly didn’t happen last night. He needs to work on an expanded shot selection without his back to the basket. He can do all those things here at UH. He would be foolish to split now. nobody’s talking about the NBA, they’re insinuating he’s going to go home to play in NZ. anderpops–that is what some beat writer threw out as possiblity, NZ teams, making offer, maybe more lucrative to him to come out after this season. The only reason why we talk about NBA, if that is Isaac’s dream. He has a long, long way to go. He has to, as you allude to, expand his game. Ideally, for a shot at NBA, or even high euro leagues, be a perimeter player as well. He cannot get shut down for 6pts , 7 boards, in college ball. Has to really elevate his game. If Isaac, works really hard, upon going home to NZ this summer, he could possibly be better wherever he chooses to play ball. Isaac can be shutdown by opposing teams in NCAA DI, so has to work on being the unstoppable guy, next year. His Ceiling is really high, great touch on his mid range shot, and FT line shooting has really gotten better. Want the best for Isaac, he works hard, gets better, elevate skill and game, he has shot to play pros. Whatever league. That is why I say, Isaac, come back for Junior season, which I believe he will. Poke Bowls and Bows! Fotu has had good games and bad games. That tells me that he’s not consistent enough, yet. He has to get it to the point where he gets 15-20 points every night and about 7–8 rebounds per game. He got 30 at Irvine, yet he gets 6 last night. Come on, man! If he scores 10 points last night, we win. I don’t blame him for the loss. I’m just pointing out that you have to bring it every game. That’s the mark of a determined player and you have to change your game if things are not working. Example, shoot some outside shots. Help me out if I’m wrong here, but I think there are 148 teams that make it to postseason (68 NCAA, 32 NIT, 32 CIT, 16 CBI). Even with a weak schedule, is Hawai’i at 20-11 considered one of those 148? I understand the concerns over costs at UH, but I like Ben Jay’s stated idea that it might be fine for the team to open on the road in the CIT (and have travel paid for), and if they win that game and get some momentum for fans, come back home to host in the second round. Everybody has their opinion about CIT and we should be doing better, but bottom line is this team just lost a tough one and CIT might (or might not) be the only option. I say give these seniors a chance at it if invitation comes. It is great to have high hopes for the future of the program, but let’s be honest … UH basketball is not like volleyball or baseball, even football that’s been to the upper ranks. I wouldn’t want to take any opportunity for granted. well, the CIT and CBI are pay to play, so realisticially, it kind of doesnt matter how good you are or arent. Fotu gets shut down because of double teams though. he wont be dominating until we get guards who can punish teams for sagging on him. spearman wasnt that guard, sham isnt that guard, and nevels was only that guard SOMETIMES. If CIT invite came, or CBI, and UH probably would open on the road, would, should UH take that opportunity? I think Ben Jay really felt for seniors, and whole team as well on the tough loss. He wants to extend season if possible. All depends. If CBI and CIT don’t even have UH on bubble, case closed. How about the Women? If Laura Beeman’s team does not win the BWC tournament, do they reject the Women’s NIT invite, if invited? I don’t think so. I think that is the scenario that Ben Jay wants: UH open on the road, if invited, CIT first round, if they win, then make vestment for host second round at SSC. He as Athletic Director, has to promote team and help them get better. That CIT AFA game last year put some fire into Christian Standhardinger. He came back on a mission. I just wonder how Seniors and team feel? Would they want to play another game in post season, come Selection Sunday, after the NCAA, NIT invites go out, then we shall see. If not before that. If Hawaii were at 16-15, and coming off this loss, I would say, in my opinion no. However, Ben Jay, really surprised last year, by accepting CIT invite and ability to host AFA, he wanted to award the seniors, Tavita, Brereton and Vander(who walked out, that one still hurts). Hope the best for team, CIT, CBI or next season. I think Hawaii MBB is headed in right direction, just have to have team next season that will dominate, I think they will. Have to play solid D for 40 minutes. JMO. Such a sad way to go out. It was awesome to see the cheerleaders, rainbow dancers, and all the UH fans in the arena! So proud to be a Warrior fan. I invite you all to check out the players’ twitter and instagram accounts. They’re a lot of fun to read and give a nice insight not only to their personal thoughts, rants, and emotions but also to the relationship they have with one another. If Fotu plays like he did last night, NO WAY will he make it to the NBA. I love you Fotu, but last night’s game was one of your worst. I’m not sure if all the travelling or emotions got the best of you but you need to show more consistency. Of course this is easier said than done. Being the great player you are, I always expect the very best from you, like 20 points a night. I wish all the very best to the seniors, especially SPEARMAN. I wish he had 5 starters with his heart and determination. If the NBA doesn’t work out for any of the seniors, I hope they all consider playing in Europe. I just hate to think that this is it for Spearman. I’m so excited for next season! Especially can’t wait for the Diamond Head Classic. Ohio, DePaul, George Washington, Loyola Marymount, Nebraska, COLORADO and WICHITA STATE! xer 21…yes, Gib upgraded at guard, however, that rim attacking, finish tough at the rim, or dish the dime to the bigs, like the other BWC guards, UH at this point does not have. Nevels, if get stronger, better defensively, he if he works on that part of game, just be better overall guard, I think he could even play PG, though like Fotu, can be shut down, or not consistent..could be really good next year. He is a baller. Smith and Shamburger have to up their games. Fleming , well we shall see, though he is 3 star rated, a pretty good get for Gib. That is exactly what I was thinking, when Shamburger went to the rim, he is so small, that he could not finish, though without him, UH makes no comeback, however, he has to learn to find the bigs and dish. I think Gib has to still uprgrade the guards, work with current, and recruit for future. You have the First team BWC guards, UH wins the title. Agree with Former UH Athlete from previous thread, with Gib on board as UH coach, completing his Fourth year, he has generated tremendous interest one way or another for UH MBB program. Remember the 3 losing seasons before his arrival? Or the not making it to Post Season, last few years of of previous coach. UH MBB was not the subject of much discussion. Now, social media explodes, it is a MAJOR topic. Why? Gib has upgraded the program with good student athletes. Think about it. No matter what experts in Hawaii(? )might say, UH NCAA MBB DI program for top 100 BB players to come here, is tough recruiting pitch. Otherwise, UH would have been elite program for 40 years straight. 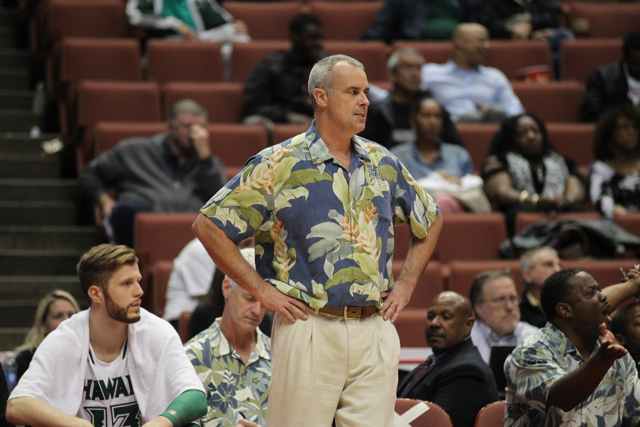 Gib has taken the direction of , sell Hawaii, the experience , the culture, the ONLY NCAA DI MBB team in town. After a lot of years, like many on this forum of watching UH MBB team, Gib has brought excitement to Hawaii. That is why we feel for team, and we have opinion, same as they would in Louisville, North Carolina, or Kansas if team is doing well, or not. Gib, right on. Look forward to next year with two top 100 out of HS athletes in Stefan Jankovich and Negus Webster-Chan, Isaac Fleming 3 star combo guard, check out his Youtube hilites, he is BB IQ smart. And hopefully scoring, defending supreme wing, and Rim protector big from Senegal, or anywhere on the planet. UH MBB is the BB program in Hawaii once again. Go Rainbow Warriors! Look forward to next season, recruiting period around the corner, go get a couple more pieces to get your team to top 35 or better level! UH should only accept a lower post season tournament bid if they are guaranteed not to lose money. If they can at least break even, I’d love to watch them play at least one more time. It was a devastating loss that I hope Coach Gib will learn from. The last five minutes of regulation and in the overtime we got outplayed and out coached. I feel for the seniors especially since they know they should be playing on today. It’s not so much the loss itself but the way we lost the game at the end of regulation and in OT. Sometimes I think Gib micromanages the game too much from the sidelines instead of letting them play. Gib is a good recruiter but needs to be a better tactician when the game is on the line. By the sounds of it, Quincy fouled before Gib wanted him to in overtime. Gib has employed the intentional foul with lead late in games before with success this year. I am in favor of doing this under 10seconds left and with an inconsistent shooting team like CSUN. 18 seconds was way early and fouling a 92% FT shooter in Greene was not a smart move. UH had time to try and force the ball out of Greene’s hands and then foul somebody else. Which brings me back to one thing Gib must learn going forward… Situational substitutions at end of game. With UH up 3 at end of regulation and OT, Rozitis & Valdes (and maybe Thomas) need to be in on defense. It would have been ideal because UH would have to go man defense and all three have length to bother any outside shots. If a 6’5″ Valdes is covering Greene at end of regulation vs a 6’1″ Smith, it’s likely he doesn’t have such a clean look for the tie. I know this is being a revisionist, but keeping a full court or 3/4 court press would have made things hectic for CSUN on the final possession of regulation also. If the press is broken for a layup, that doesn’t hurt you that much in that situation. Breaking a press usually doesn’t end up with a 3pt shot unless it’s practiced a lot. Virtually no coach practices a press breaker to end in a perimeter shot. Typically successful press breakers result in layups/dunks because of the number advantage they create if successful. Games have been exciting this year, mahalo to the players. Fotu: shot only 66% FT last year, this year officially 74% but he had to play with a cast for a couple games so I feel like he’s closer to 80% this year. Nice improvement. Not going to get my expectations too high, so hope he keeps improving. His shooting % is almost as good as Nevels, unfortunately Nevels almost blocked as many shots as the big Tongan. Maybe best 20 yo offensive forward UH has ever seen (I’ll listen to other opinions). To play NBA is something else though, it’s a pick-and-roll league. You have to run it, and you have to defend it. Seniors: Standhardinger really did accomplish some achievements (2-time all conference first team), and his relentlessness in bulling to the rim (and unreliable outside shot) made me think of Carmelo Anthony haha, the Pacific version. Rozitis had a memorable personality, and I’ll remember him defending at the top of the key. I have no doubt he’s a good basketball player, but when you get to the college level it’s more about the team, and he took to his role well. Spearman, I’ll remember the long sleeve shirts. He is a real smart player, unfortunately we had to ask him to also supply 3 point shooting, and he could do it some times. A guy like him is indisposable when you’re putting together a team. He was solid, took to defense, and shot high % near the basket. That was his game. Had quite a few close games this year. Couple UH got W. Several UH came out on short end. Remember those SSC games against top 3 in BWC? UH had chance to win or close out , could not do. Funny at beginning of season, UH was pretty good at closing out games. We soon forget, UH won 4 consecutive games on the road in BWC, and they got huge win at Irvine on the road. So UH has some good wins. Shamburger had some good games to help in that 20 win season. 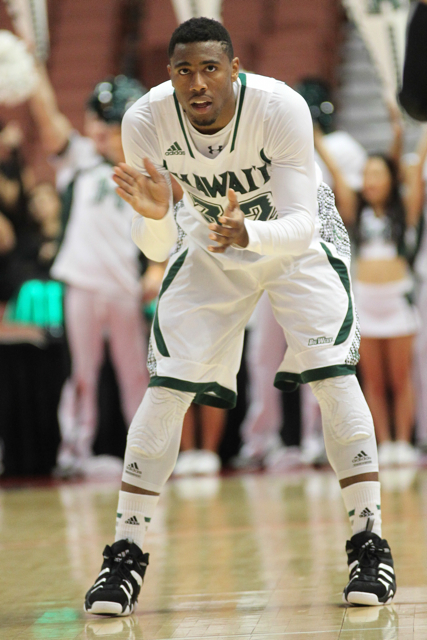 He is best PG that Hawaii has had in maybe 10 years. However, bottom line, UH wins that game, Happiness in MBB fandom, they lose a heartbreaker, the armchair quarterbacking. It still is a mystery, why Standhardinger did not really touch the ball in closing minutes of regulation and OT. I think that Shamburger was hot, hit some key shots, to give Hawaii a chance, and they left it in his hands to help UH close game out. Shoots, if UH, as a team , hung their heads, like UCSB , against that hot shooting Poly team, UH would have lost by 20 pts. However, they did comeback from, I think it wasn’t 16 points, I think they were trailing 34-17 at one point, so 17 points down first half, make run to close to 4 points at half, then go up 13 in second. So about a 30 point swing, which is what makes this team so special, in the past, UH teams would get blown off the court. AT this point fans, it is 20/20 hindsight, sure wish UH could have pulled off the win, from Coach Gib on down, the athletes, for awhile will feel the sting of defeat, when they finish school in May, the sting will go away, maybe even as soon as April awards banquet, and any news after that of potential signings of 2 more recruits. Wonder if Uncle Riley will work out something with UH Ben Jay, and UH gets to play a few more games, would be good time to work on the close out game bugaboo, and help the next year players, Thomas, Valdes, Jovanovich, etc get some experience. Well, if UH can break even, money wise, would make sense, however, it still would be weird, a 20 win season, even if SOS is not great, and NO POST season. I remember when UH with Little as coach even at 17 wins, NIT was so exacting , his team did not get invite. Now with pay to play, CBI and CIT, it gives opportunity for UH type teams to play a little more. Former UH Athlete, You think that UCSB will reject a CBI or CIT invite? I don’t think so. Will they be invited to NIT, don’t know. would Beeman’s team reject a WNIT invite if they don’t get to Dance? don’t think so. However, I know that Ben Jay, is doing everything he can, that makes financial sense to secure, interest in CIT, CBI, however, it looks unlikely. Would be a nice surprise if UH got invited, and it was prudent to accept! Rainbow Warrior MBB team ARE Warriors and Great guys! Be on track to get your degrees, and keep up the GPA’s! Currently no team in the Big West is Top 100 in RPI. Consider that 68 teams in Big Dance + 32 teams in NIT (correct me if I’m wrong). So there’s a real possibility that the only Big West team to make postseason is the conference champ. Real hard to see more than 2. The Big West has such low esteem, I don’t know if getting into CBI/CIT would help. And I’m not going to say who the Big West should support in post-season sponsorship. Might be worthwhile to make an investment, for future benefit of the conference. Would be curious in BWC supporting pay to play tournament, however , why not? BWC schools, I don’t think any has a Football team(ouch!). Still think as AD, Ben Jay will do all he can to see if financially able to break even in pay for play CIT or CBI. Those are pretty competitive tournaments, Some of the winners of that, went on to next year and went to NCAA’s. Wish the best for team. Live and learn. Coach, and athletes. What other NCAA DI MBB program do we have in Hawaii? Only the Rainbow Warriors! The best in Polynesia! Love to talk the hoops, here we go again, still have major interest for or against. Gib hit the recruiting trail! CIT or CBI. ? wait and see, or see you all next season! Was very entertaining season. Better 20-11, then 11-20! LAST YEAR 2013 CIT OPENING ROUND sample of teams played 2013..
well…that is official…Women and Laura Beeman run to BWC tourney crown done. Lose to Cal Poly in semifinal game. So neither MBB or WBB team go to NCAA’s this year. Maybe next year. Both programs very competitive. Long time since both WBB and MBB have created a stir in Hawaii. Congratulations to Men and Women BB athletes! Looks like Isaac Fotu will be back next season. 3 hours ago he tweeted “Preparation for next season starts right now.” A few minutes ago he tweeted to Shamburger “Can’t wait to shut these haters up with you bro”. LOL – this is random but I thought it was hilarious how one of the fox commentators kept pronouncing Keith’s surname as ‘ShAHHHmburger’. That Isaac is coming back. The best thing. He , if put in the work , can have a Monster year. Look forward to next season. UH will have hard time replacing Standhardinger, Spearman and Rozitis, so time for Fotu and the guys to step up. Like Warriors that they are, they will. ..Really credit to them. This team are battlers, they will have great season next year. Excitement begins, NOW. TAVS- Isaac Fotu, Shamburger and whole team , have a lot of support. Whole Rainbow Warrior Nation feel pain of that loss to Northridge. Those guys and gals who call talk show radio, or blog in retrospect, have they followed how team has developed for this year? Your team, has great respect of the long time die hard fans. No question. UH MBB is back. Next year, will be a loaded and payoff year for Gib and team. Team has to play whole game of intense defense. I think that is the key. Shutdown defensively teams, the offense will be there. WI, majority of posts, a Lot Of Love for Fotu, Shamburger and whole team, they did Hawaii and UH and global fans , and families PROUD! Mahalo to the 2013-14 Rainbow Warriors! Great year and effort! Look forward to next season, will be AWESOME! This team the Rainbow Warriors could score! Averaging overall , 80 ppg. Despite the uptempo pace, which we loved, scoring within 8 seconds or so of shot clock, averaged 11.8 turnovers per game, which is fantastic. Great stats that contributed to good season! Also Standhardinger 18 ppg, Isaac Fotu, about 15 ppg, Nevels 13.1 ppg, Spearman 11.3, and Shamburger, who shot nearly 84% from FT line, for a PG, that is awesome, 9.3 ppg, and a little over 5 assists per game, with more assists to turnovers. So great job by that starting Warrior Five! Effort, and Heart, No question! Cal Poly upset UC Irvine, 61-58, and Cal State Northridge upset Long Beach State, 82-77. Cal Poly vs. Cal State Northridge for Big West championship on Saturday. Who would’ve thought that? gman, telling a story you heard from some other guys IS spreading a rumor. thats like dictionary definition dude. also, HORSE Champ, this conference was never going to be a two bid conference. we knew that going into the season. it wont ever be a 2 bid conference for at least the next 4-5 years. also, top 75-80 is the usual cut off for the NIT. not top 100. Thanks for the update Dayton. I do feel oddly better about ALL of the top seeds collapsing and wish the best for whoever goes on to dance for us. BrokenHeartedInAnaheim…wacky Big West, Poly and Northridge, 2 of lower seeds , one of them going to the Dance. Number 1,2,3,4 all went down…Irvine toppled, Santa Barbara got blasted, and Northridge took care of LBSU..these conference tournaments, in particular this Big west, where teams with losing records in conference and out of conference can still make it to the dance. What can do? Just have to wait for next season. May Be Three, even Four, Teams CAN Improve Into The Top 100..
How High? 40’s like Previous LBSU? 60’s ? 80’s? Could UH have Spring boarded UC Irvine AND Northridge to The Top in Back-to-Back Years? Seems like we have been saying year 3 was Payoff year. Then Year 4. Well Year 5 and 6, very sure Gib will be here. So, with those 3 star athletes, Thomas, NWC, Jankovich, Fleming, ( and probably another 2 more signees)and All BWC player Fotu, as well as the good guard play of Shamburger, Nevels and Smith. UH has a lot of upside for coming year. If next year’s team can play with passion and desire of Spearman, Standhardinger and Rozitis, which I believe they will. UH will have several more wins in conference, challenge outright for regular season and Tourney championship and NCAA invite. Do We Appreciate the current UH MBB team, without question, great Warriors, who fought to the end, never backed down, and gave their all. This team has always bounced back. And it will again. Hey 20 wins this year, Maybe next season, 27 wins regular season, and 12-2 BWC record, and NCAA invite, why not. Negus, has great vision mindset, he and Jankovich thinking, whynot prep and prepare to think Big and train develop to contend for National title. ?Same with, Filipovich, probably Fleming when he gets here, Fotu, Shamburger, Nevels, Thomas, Smith, Valdes, all getting ready for next year. And Also, a repaired and healed Brandon Jawato! The missing 3 point marksman. Pretty sure if Brandon were 100% this year, would have made difference in UH scoring enough to have won the close games. If hosting or being part of C.I.T. tournament is a financial thing. Some say $40,000.00 per game to host, or buy into, with costs, how about using the SSC for a benefit concert. Benefit concerts have raised money, on moments notice for disaster relief, to help children in need, elderly, take care of the lands, and Food for needy, etc. I think there are local entertainers, even with roots to UH system, either Manoa graduates or part of community college system, or fans of UH MBB ,who would perform on short notice. Also have phone banks to call in pledge. Some of these benefit concerts have raised over $100,000.00 on a short turnaround. I think that is what Stan Sheriff Center was supposed to be for too, Concerts for a good cause, or to generate revenue for UH. Would put a State facility to good use. Great concert, and have local chefs, and restaurants, prepare, for price, fine food, local and gourmet style. Just throwing it out there, it would make sense, get the community involved, it would be something beneficial for team, fans, and the monies generated would offset the cost to buy into CIT or CBI. No monies from AD dept, UH, or State tax. Monies from Donors…Just a thought. Might be off the wall, however, just thinking about the Seniors and the way the whole team battled to be in position to win. Yes, I know sounds crazy, however, still feel bad for Spearman, Standhardinger and Rozitis. What a way to end the BB season. Never question Heart of this team. One of the best effort team I have witnessed, yes, I went to games too, in a decade or more. Well, wish the best for Seniors and whole team coming back next year. Should be awesome season 2014-15! Actually, the concert or fundraiser, would be MBB specific, and could be held leading up to or part of April awards banquet. Generate excitement for next season, and award guys on team. Makes more sense. Would still have to get that credit for 40k upfront first, then have fundraiser to cover costs. So ticket holders to game, would not have a double whammy. Crazy, however, a lot of us UH MBB fans, are crazy for great NCAA DI MBB! Rainbow Warrior team…very exciting…looking forward to seeing next season too. Anyway, thanks for your time Ben, working the late hours, and trying to elevate UH athletics, UH AD a challenge! There are a lot of reasons why UH didn’t win that game, but the biggest one is because Josh Greene refused to let Northridge lose. All he did in the final 10:16 (5:16 of regulation, 5:00 of overtime) was hit all five of his field-goal attempts, including four 3-pointers, and both free throws That’s 16 points in the 10 most critical minutes of the game. He did what Christian tried to do as a senior, lead his team to victory. All in all, an entertaining season but a difficult way to end. Mahalo to the three seniors; their on- and off-court leadership will be sorely missed next season. Despite the gut wrenching loss, the Seniors set the foundation for what we hope are what future UH teams will be like. Had the pleasure of sitting next to Christian’s grand dad at the Honda Center, and he showed the passion his grandson has for the game. With that said, What the team needs, for that matter all UH teams need, is the support of the Hawaii community, like Christian’s grand dad, who show that passion and not bandwagon fans. For the state of Hawaii may never land a professional sports team and UH is and continues to be the biggest game in town. Mahalo, Christian, Brandon and Davis, You make me proud to be a UH Warrior fan. May Season 5, bring the results of what you have started. The players are burnt out they gave their all. No to buy in and having to fork out more money to coach who blew it in the last 8 minutes Cal poly , Northrudge , two teams we beat. Now I. Finals. We should have been there. Pau enough. What a way for the seniors to end their careers. Great group of seniors, but I feel ba that they were short changed by an inadequate coach. There is no doubt Gib can coach but his in game tactics are awful. He’s in year 4 so there aren’t many excuses. I hope Rainbow Warrior MBB nation sticks it out with the team and their effort. It is sad all the talk shows, water cooler conversations, supermarket, schools, down the street. Everybody talking about the UH loss. Lot of that after the fact talk. The loss is done. Move on. Never knew UH MBB had that much interest. Yes, I hope AD stands up for the WBB and the MBB teams, and helps them finish in positive way. Strange how teams finish with winning records, and some good wins during season, and people talk about team in tragic way. The MBB team, hard workers, when they battled Mizzou on the road, and NMSU at home, that gave me indication, not only team had Large Heart, also they had better talent to compete. Hope next year with Negus, Stefan Jankovich, Fleming and needed frontcourt help, and a scorer, will be that 27-28 game winning, NCAA invitation team. I think they can do it. Rainbow Warrior MBB team: We are backing you all the way, through wins and losses. Spearman and Christian, Rozitis, were part of a big turnaround in wins and interest in excitement of UH team. Mahalo to team. Winners, and nothing negative to say, You gave it your all! Early look ahead to next year. Drbe Enos, PG, SG, Soph. Jack Hackman, SG, SF, Soph. There is a big void for a very good big man, either a PF or C, somebody 6-9 to 6-11 with some bulk. A rebounder/shot blocker. Jovanovic isnt going to start, more than likely. look for Thomas to fill out, or us to pick up a more mobile freshman. and im hearing Jankovic will be considered a junior if he plays mid december. Next year I think if Hawaii has to schedule more teams like UH Hilo and Chaminade. maybe schedule BYU Hawaii and Hawaii Pacific why not? 27-28 wins Why not? National title? LETS GO BOWS!! To host a CIT or CBI game, if UH got invited. You would think Taco Bell, Hawaiian Air,Bank of Hawaii and Oceanic Time Warner, to those companies, covering $30,000-$40,000 would be a small price to pay to sponsor the host fees. Oceanic has the coverage of UH sports for next several years, they must be worth a billion dollars, and BOH, well they have a lot of cash. Hawaiian Air. Think that AD Ben Jay, would have those type of partners to fund UH sports post season, would jump at chance. In past when UH got invited to NIT, at least one sponsor, covered some expense to even televise locally. Either way, Warriors did us proud. Go Rainbow Warriors! Work hard in offseason, and Gib , get a Big, and a big time ready to play scoring force. RECRUITING, name of the game. Look forward to next season! Time to close the book on this year. Mahalo to Davis, Christian, and Brandon—true warriors. Next year we will be more balanced in positions. We got some nice new players coming in. But if I were this year’s bench I would have the attitude that it’s my time to shine and I’m going to do everything it takes to improve my position. If you are good enough to make the team you are good enough to be a major player. Don’t believe me? Go ask Bill Amis. In his first year he was Mr. butterfingers. Every year he improved and in his senior year he was the top player of the team. If you need to be a gym rat then so be it. You just need to out play, out practice, out dedicate, out pain, and out sacrifice everyone. Hard work. Most can’t do it. But a few can; and they are playing pro-ball somewhere. You know who you are. Ditch the parties and girls and go to work and perfect your game. Don’t forget your studies though. Looking forward to summer league. Cal Poly completes crazy upset run through the Big West with a 61-59 win over Cal State Northridge in the championship game. Cal Poly was the No. 7 seed (out of eight teams). Gives hope to all teams that might have a subpar regular season that anything is possible in the conference tournaments. Cal Poly’s overall record is 13-19. Pretty embarrassing, but credit to them foe going to the dance. Obviously, they will be a 16 seed and will have to play a play in game. The winner is projected to play #1 seed Wichita St.
according bracketology Joe Lunardi from ESPN. NWC isnt playing the 4. they’ll out thomas or Valdes or Jovanovic in before they do that. Correct. NWC most likely got 3 all to himself and they should keep him there so he can get comfortable with the position. We need shooters like we desperately need rail transit. The real dog fight will be the 4 spot, especially during the fall semester between Thomas and Valdez. Although Valdez is small for power forward keep in mind of the fact that Cal Poly was extremely small in just about every position and somehow managed to win the Big West. But they were very disciplined on both sides of the floor and chose the right time to be the hottest team in the tournament. Just goes to show you can win even with lack of height. (Cal Poly reminded me of the Derrick Low Washington State Cougars team a few years ago). Plus Valdez plays big in that he can play above the rim and is a good offensive/defensive rebounder and seems to be comfortable around the paint. As for Thomas he’s got the potential to elevate his game but he needs to push himself from now until next season. These two guys got the inside track on grabbing the 4 spot. If Jovanovic did not have to wait until December I would say he would be right there with the two. Not saying he can’t do it but he’s got his work cut out learning the system and getting in live game situations. Usually once coaches go with someone it’s hard to take it away unless he goes into a shooting slump or the other guy is having zone type games every time. And the sooner the Coaches pick’em the better off the team will be because then you can start strategizing plays and perfecting them. UC Irvine with their #114 RPI did get into the NIT. So 2 teams from the Big West barely made the NCAA/NIT postseason. Incidentally, they will be playing #1 seeds. Interested to know how UC Irvine made it in; it would seem reg season conf. championship at least counts for something. If Cal Poly can keep Wichita St. under 60 points, then they’ll be in the game at the end.